This quick and easy seafood recipe is lightly seasoned with lemon juice, olive oil, garlic and parsley and cooked in ghee. It's also Whole 30 and Keto-diet approved. The key is not to move the salmon after you add it to the skillet to really crisp the skin. Serve with spiced cauliflower rice, mashed root vegetables or on top of a salad for a healthy, filling lunch or dinner that's packed with protein and omega-3s. Use a cast-iron skillet for maximum crispiness and Italian or flat-leaf parsley instead of curly parsley, as it has much more flavor. Ghee is readily available at many grocery stores, but you can also make your own: melt 1/2 cup butter in a small pan and skim off and discard the milky whey from the top. Refrigerate remaining clarified butter. Ghee has a higher smoke point than butter, making it a great cooking fat for all types of dishes. For another delicious salmon option made popular at Red Lobster (but easy at home), try our Salmon New Orleans. Per Serving: 596 calories; 41g fat; 3.2g carbohydrates; 51g protein; 159mg cholesterol; 291mg sodium. Easy to prepare dish that I pair alongside a basic salad or just a quick lemon-dill yogurt sauce with. You will definitely want to get the salmon skin as crispy as possible to make it a palatable as possible. 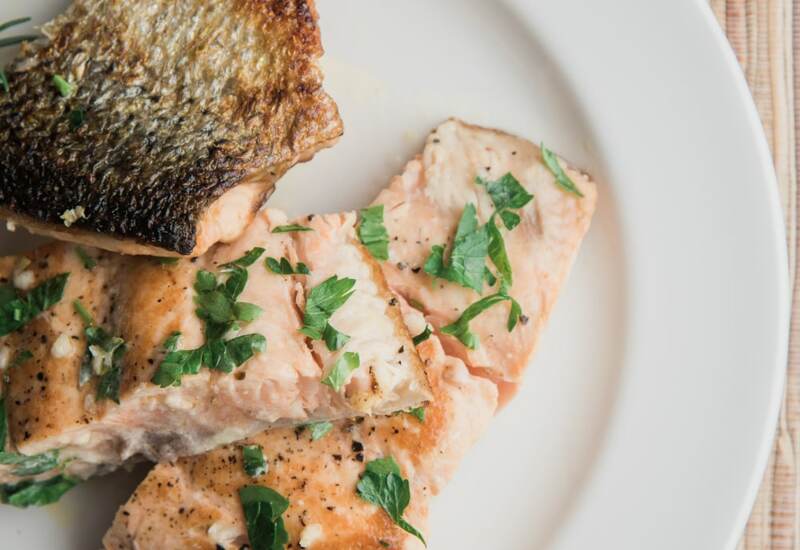 I love this crispy skin salmon, it's perfect and adds so much flavor to the dish! The lemon garlicky flavors are superb! This is one of my favorite recipes. I made these minus the salmon skin, I prefer mine without it. I also made my own ghee and now I'm obsessed with making it myself! I used regular butter for this recipe and pan-fried the fish in my cast iron until I got extra crispy skin. It was really good, especially the lemon garlic sauce. I used three cloves garlic instead of two. Yum. Easy recipe! I usually bake my salmon, but this pan-fried version is just as easy. I had it with cauliflower rice and sautéed spinach. Perfect dinner for two.